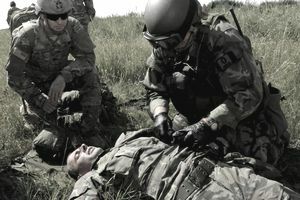 The special operations medical sergeant employs conventional and unconventional warfare tactics and techniques in providing medical care and treatment. Performs and maintains proficiency in all Major Duties- Ensures detachment medical preparation and maintains medical equipment and supplies, provides examination and care to detachment members and establishes temporary, fixed and unconventional warfare medical facilities to support operations with emergency, routine, and long-term medical care. Provides initial medical screening and evaluation of allied and indigenous personnel. Manages detachment, allied, or indigenous patient's, administration, admission and discharge, care, laboratory and pharmacological requirements and the initiation, maintenance and transfer of records. Orders, stores, catalogs, safeguards and distributes medical supplies, equipment, and pharmaceutical. Supervises medical care and treatment during split detachment missions. Operates a combat laboratory and treats emergency and trauma patients in accordance with established surgical principles. Diagnoses and treats various medical dermatological, pediatric, infectious and obstetric conditions using appropriate medications, intravenous fluid support, and physical measures. Develops and provides medical intelligence as required. Note: You cannot enlist with a guarantee for this MOS. New recruits interested in Special Forces may enlist under the 18X, Special Forces Enlistment Option. They then attend Infantry OSUT (basic training and infantry training in one course), and their Special Forces MOS (18B - Special Operations Weapons Sergeant, 18C - Special Operations Engineer, 18D - Special Operations Medical Sergeant, or 18E - Special Operations Communications Sergeant) is determined during the Special Forces Assessment and Selection portion of their training, based on their interests, qualifications, and the "needs of the Army." There is no civilian occupation that is directly equivalent to MOS 18D. However, emergency medical technicians and paramedics make use of the skills developed through MOS 18D training and experience.